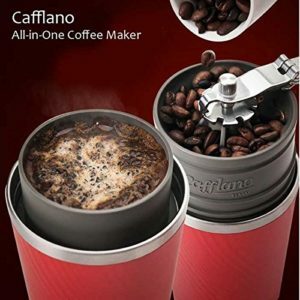 Home » Coffee Makers » Can Caffiano make your coffee even more portable? 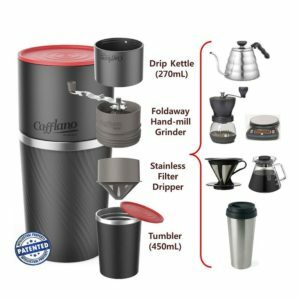 Can Caffiano make your coffee even more portable? 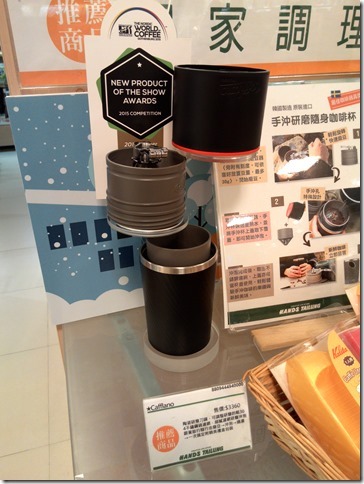 I was in the local Sogo department store here in Taipei. 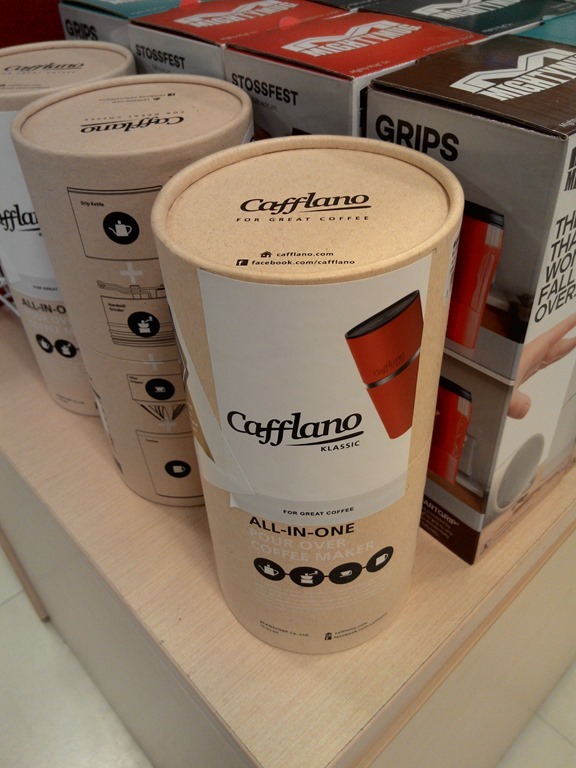 There is a little shop that stocks interesting and unique products from Japan and other parts of East Asia called Hands Tailung. 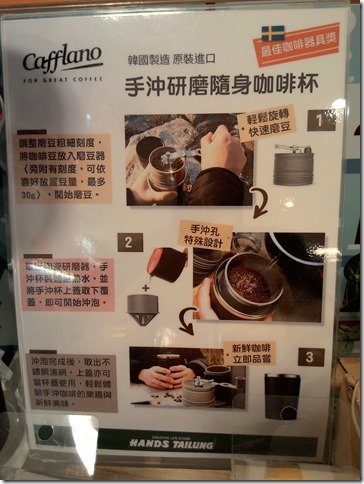 It’s the middle of Chinese New Year, and very busy, still I managed to find a great coffee product that is perfect for your picnic or business trip. 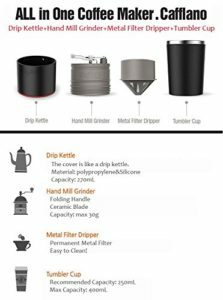 At first glance, it looks like a large coffee travel cup, but once you open it, you realize it’s almost a complete system for measuring, grinding, and making the perfect cup of coffee. Let’s take a look at the image below. The stand features the exploded view: a measuring cup on top, the grinder is in the middle, the filter cone is the light gray insert and the black base is the mug. Simple, elegant. 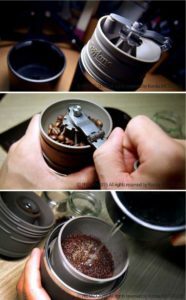 I’m not exactly sure what the meaning of the ‘drip kettle’ refers to, but the hand mill is an effective little grinder. 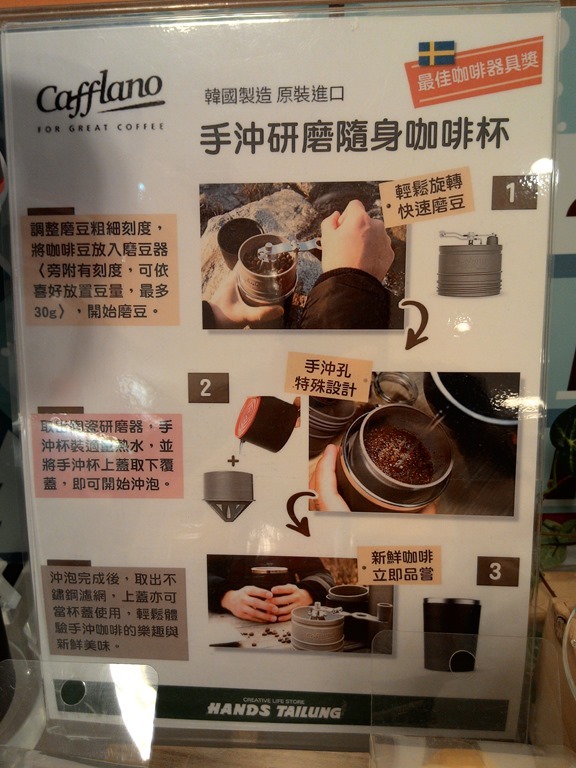 Once you grind the coffee, the coffee falls into the dripper. Just add hot water, and wait a little. Voila! You can check out the reviews, prices and order information at Amazon where it’s on sale from one vendor for about $130.00. Click for more information. Has it really got oomph? Will it make your coffee? Coffee Pods: Convenience at What Price? Save your Money, Health and Planet!